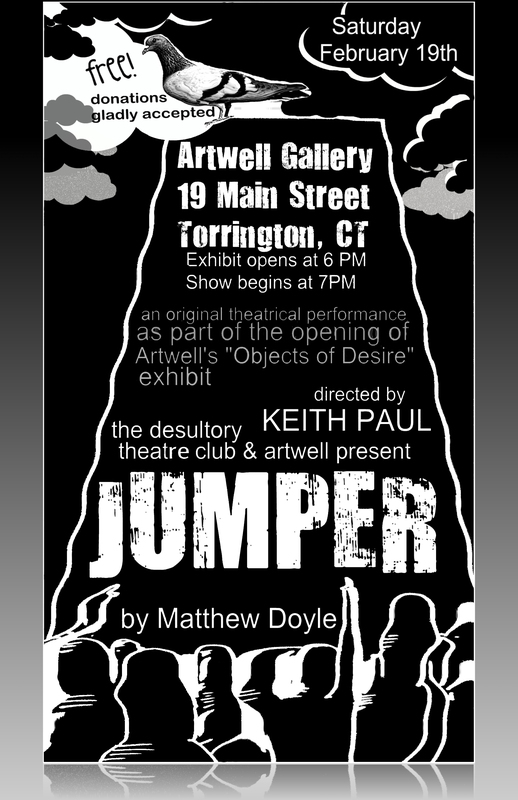 So our First show took place as the entertainment for the Artwell Gallery‘s opening of their “Objects of Desire” exhibit. Our First piece was a play called “Jumper” by Matthew Doyle. A 12-minute play stuffed in the middle of a two-hour event. The story of a man who has lost everything and one day debates jumping off a building. That is until a pigeon strikes up a most unique conversation. The Place was packed and The Desultory Theatre Club was off to a great start! You can view the photos from Jumper here. This entry was posted in Theatre and tagged Matthew Doyle, Theatre. Bookmark the permalink. Well, Here We Go. Welcome to the Web, Desultory Theatre Club!